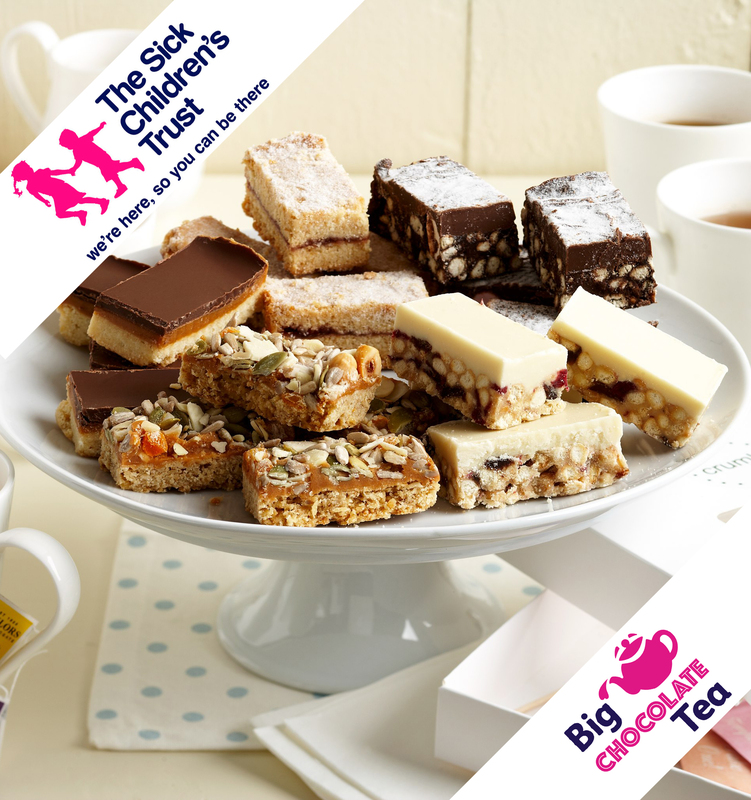 The Big Chocolate Tea party box has been developed in association with The Sick Children’s Trust. Crumb will donate £5 from the sale of every box to the charity. 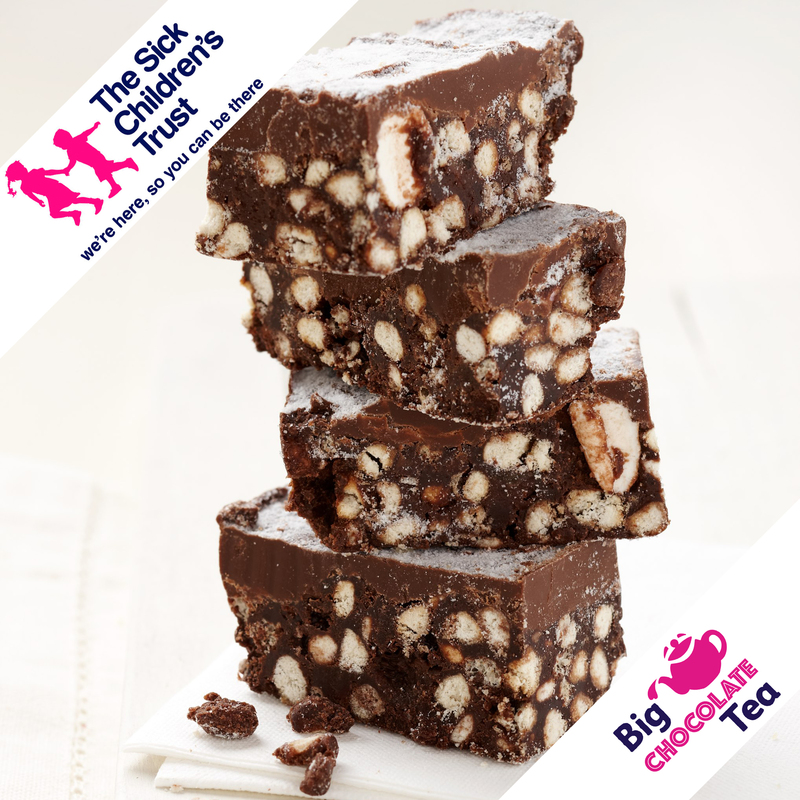 We’re supporting the Sick Children’s Trust Big Chocolate Tea campaign – the biggest annual fundraising event for chocolate, tea and baking lovers! The box contains everything needed to host an amazing, chocolate-filled tea party: a selection of fine teas, 2 luxury melting hot chocolate sticks, a range of delicious handmade cakes, and all the trimmings, including napkins, doilies and cake decorations, to make a truly memorable event. 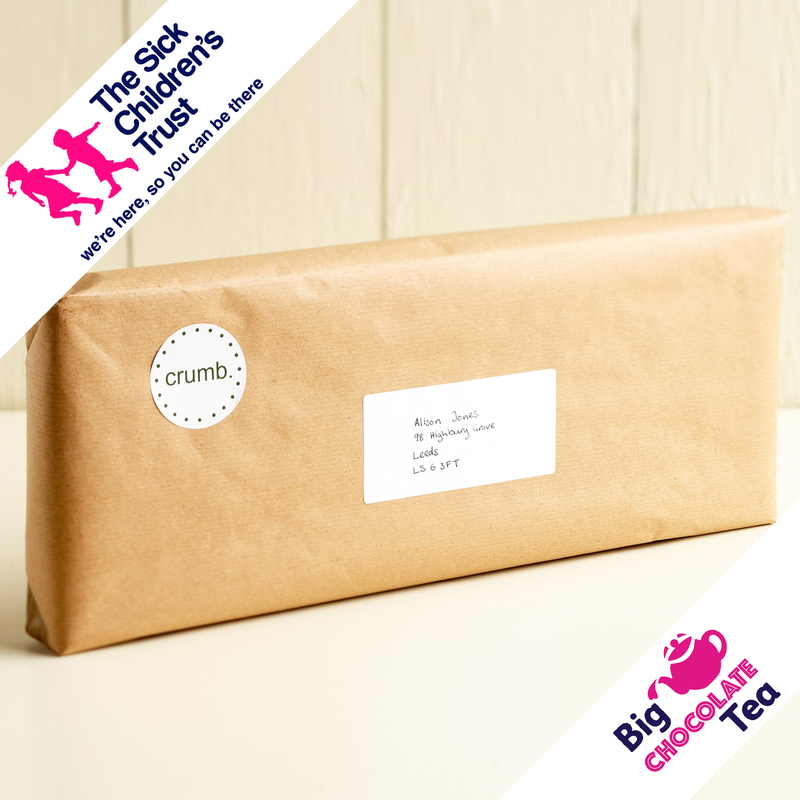 Crumb will donate £5 from the sale of every box to The Sick Children’s Trust, to help them continue the fantastic work they do providing emotional and practical support for families with seriously ill children in hospital. All our cakes last well, something we have specifically ensured so that we know they will taste fantastic whether they are eaten straight away or saved for a party and ordered early. Even the strawberry shortbread stays really soft and moist, nothing like a packaged shortbread. The afternoon tea is beautifully packaged and arrives wrapped in traditional brown parcel paper. It is sure to delight both those ordering for themselves and those lucky enough to be surprised with a gift. When ordering a gift for a loved one, crumb. will write your personalised greeting on a card and tuck it inside the brown parcel paper ready to be found and raise a big smile. 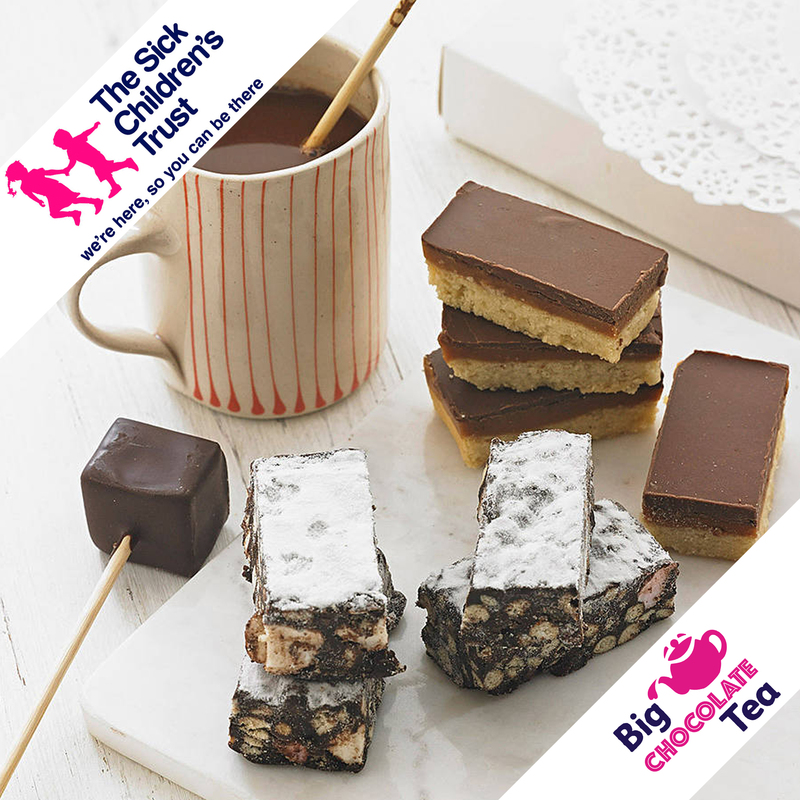 The Chocolate Tea Party Box is perfect for hosting a tea party with friends as a celebration or part of a fundraising event. 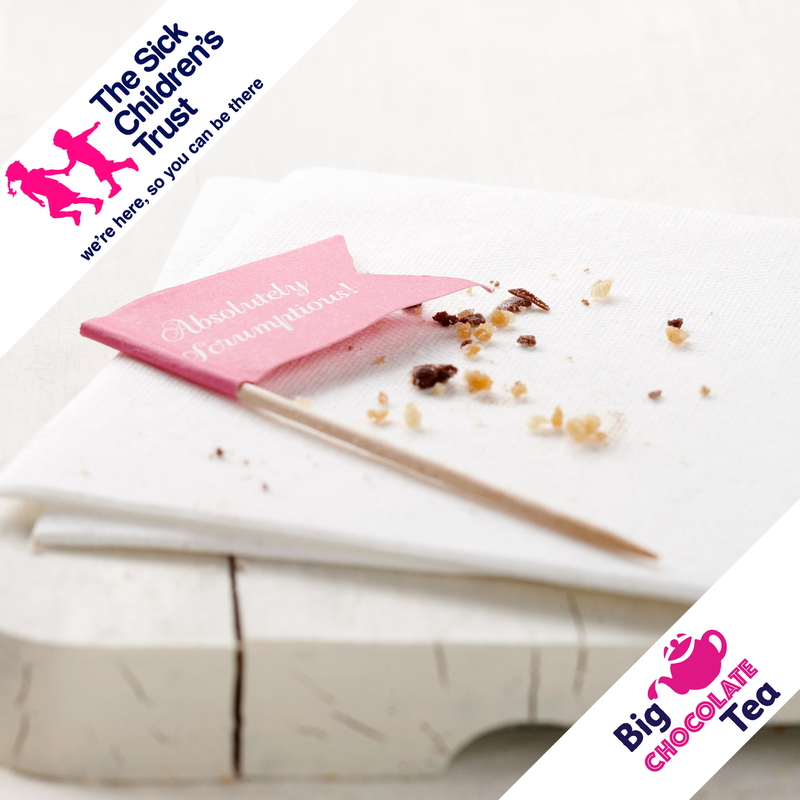 Alternatively, send as a gift for a birthday or new baby or cheer someone recovering from a recent trip to hospital . It also makes a wonderful gift for any lover of fine tea and cake on any occasion, or to make an occasion. Crumb. works closely with one of the finest bakeries in the region who hand make all of their products to the highest possible standard. The cakes all have a very homemade feel to them and taste as if they were baked by you personally, making them perfect for an afternoon tea party. The cakes that fill The Afternoon Tea Party Box are quite simply exquisite and delicious. Included in the box are some more traditional teas, such as Afternoon and Earl Grey, and some more contemporary ones, such as Blackberry and Raspberry. All of the teas are sourced from Taylors of Harrogate, one of the few remaining independent tea merchants in the United Kingdom. The teas were chosen for their fine quality, having been sourced from the very best gardens and estates around the world. – chocolate rocky road, yogurt topped cranberry tiffin, chocolate caramel shortbread, strawberry sandwich shortbread. – earl grey, yorkshire gold, afternoon darjeeling, delicate green tea, blackberry and vanilla, orange and lemon. 6 petite side plate doilies, 6 entre napkins, 5 decorative cake topper flags. Product dimensions 15cm x 3.5cm x 38cm (our boxes are letterbox friendly and fit through a standard sized UK letterbox). You can add a gift message to be included; please enter it in the box provided above. 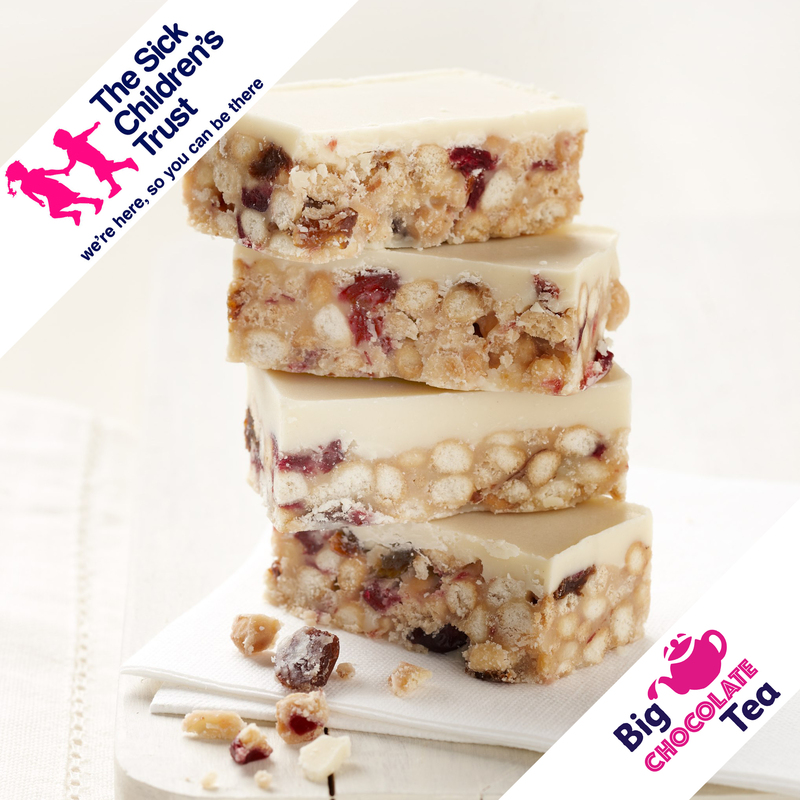 Yoghurt Topped Cranberry Tiffin ingredients include: yoghurt coating, biscuits, malt extract, cultured skimmed milk, golden syrup, margarine, sultanas, cranberries, rice cereal. Strawberry Sandwich Shortbread ingredients include: wheat flour, sugar, butter, margarine, strawberry jam, golden syrup, vanilla essence. Luxury Seeded Nut Granola ingredients include: oats, margarine caramel sugar, golden syrup, butter, black treacle, pumpkin seeds, sunflower seeds, flaked almonds, chopped apricots, whole hazelnuts, chocolate chunks. Luxury Caramel Shortbread ingredients include: caramel sugar, cocoa powder, wheat flour, butter, margarine. Chocolate Rocky Road ingredients include: dark chocolate, biscuits, marshmallows, golden syrup, margarine, sultanas, cocoa pwder. Allergens: gluten (wheat flour, rice cereal, oats), soya/soya derivatives (yoghurt coating, chocolate, caramel), milk (yoghurt coating, caramel, butter, chocolate), nuts (almonds, hazelnuts), sulphites (apricots, strawberry jam), may contain nut shell fragments. Your Gift Box is simply ordered and paid for online, and delivered through the letterbox. Once ordered, it takes 2-5 working days to arrive. Delivery is free and is by royal mail, first class.